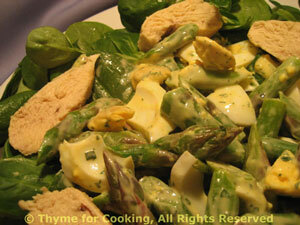 Chicken, Spinach and Asparagus Salad, Thyme for Cooking's Healthy Weekly Menu. With leftover Cornish hen, this is a quick, simple summer salad.... Perfect way to start the week. I was thinking 'Egg Salad' when I made this - thus the mayo based rather than yogurt based dressing. Add some crusty bread from the bakery if you like.